The conference will take place in Tirana (Albania) on December 5-6. 50 child protection experts, representatives of authorities, and academics from 9 countries will attend the conference. Budapest, November 23, 2017 – The third annual regional conference of “Child Protection Hub for South-East Europe” will take place in Tirana (Albania) on December 5-6. As an effort to improve the effectiveness of child protection services, the conference will discuss existing quality mechanisms in child protection and explore good or promising practices. More than 50 child protection experts, academics and representatives of national authorities will participate in the event. For the past 3 years, the “Child Protection Hub for South-East Europe” project has been successfully implemented in Albania, Bosnia and Herzegovina, Bulgaria, Croatia, Kosovo, Romania, Moldova, and Serbia. The annual regional conferences are an opportunity for senior professionals to network and exchange experiences. Prior to the event, national reports were produced, where researchers analysed the quality assurance mechanisms of child protection services in 8 countries of the region. 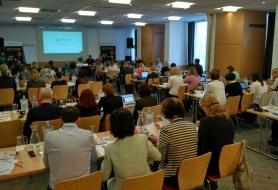 The conference gathers researchers to present the reports and share their findings. Together with leading child protection professionals, they will identify good and promising practices. Based on this, representatives of each country will develop action plans to improve child protection quality mechanisms in their country. Further, the experience of two countries will be explored: Serbia’s minimum standards for working with refugees and migrants, based largely on the Minimum Standards for Child Protection in Humanitarian Action; and Bulgaria’s child-centred monitoring system as a response to raising the quality of childcare. “The existing ordinance for criteria and standards for social services for children have to be updated and should address the main quality principles, related to the contextual aspects, process of service delivery and benefits/outcomes for clients”, says Natalia Guerassimova Hristova, the author of the Bulgarian research paper. During the conference we will tackle one of the main challenges of any child protection system: how to ensure children’s participation in monitoring quality of services. The host country of the conference will be represented by Jezerca Tigani, Terre des hommes Country Representative in Albania and Kosovo, joined by key actors in Child Protection System of Albania and the region, such as Sasa Stefanovic, Director of Network of Children’s Organizations of Serbia, Maia Banarescu, Ombudsperson for Children’s Rights in Moldova, Miroslava Kharchenko, representative of Ombudsman’s Office in Ukraine, and Fitore Rexhaj representing the Ministry of Labour and Social Welfare of Kosovo. For real time updates from the conference, follow our Twitter account and Facebook page. Join us as we strive to promote and safeguard quality in child protection. The project is coordinated by Terre des hommes Regional Office for Eastern Europe (Budapest) and implemented through partners in 8 countries: Terre des hommes (Moldova, Albania, Kosovo, and Romania), Brave Phone (Croatia), Know How Centre for Alternative Care for Children (Bulgaria), The Center for Youth Integration (Serbia), Save the Children North West Balkans (Bosnia and Herzegovina).